Leaf: 1--10, basal, linear. Inflorescence: scape 3--50 cm; bracts several, papery, acuminate; pedicels slender, not jointed, erect. Flower: perianth parts +- free at base, not forming obvious tube, lobes spreading, generally equal, lanceolate or oblong, white to green-white or +- blue; stamens 6, filaments thread-like to dilated, occasionally overlapped or fused but not forming cup, anthers attached at middle; style short, club-shaped, persistent, stigma 3-lobed. Fruit: +- spheric, 3-angled. Seed: irregularly angled, black. Species In Genus: 3 species: southwestern United States, northern Mexico. Etymology: (Anagram of Allium, from superficial resemblance) Note: Muilla clevelandii moved to Bloomeria. Leaf: 3--10, 10--60 cm. Inflorescence: scape 10--50 cm; pedicels 10--50 mm; flowers 4--70. 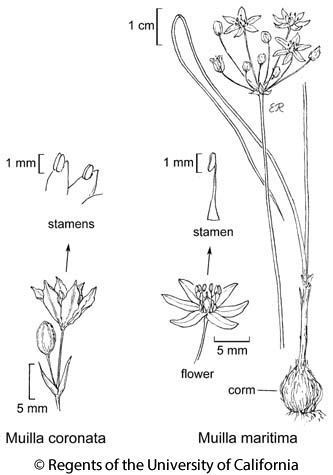 Flower: perianth lobes 3--6 mm, green-white, midveins +- brown; stamens 2--5 mm, filaments thread-like or wider at base but not dilated, anthers green, blue, or purple. Fruit: 5--8 mm. Chromosomes: n=7,8,10. Unabridged Note: JEPS17645, UC119714, UC565350, if verified, would voucher central SNF. POM291274, if verified, would voucher southern SNF, JEPS91192 and UC1561103, if verified, would voucher Teh. Citation for this treatment: J. Chris Pires 2012, Muilla maritima, in Jepson Flora Project (eds.) Jepson eFlora, http://ucjeps.berkeley.edu/eflora/eflora_display.php?tid=34146, accessed on April 25, 2019. NCoR, GV, CW, SW (exc ChI), w D; Markers link to CCH specimen records. Yellow markers indicate records that may provide evidence for eFlora range revision or may have georeferencing or identification issues. Purple markers indicate specimens collected from a garden, greenhouse, or other non-wild location.